We are your source for kids carpets featuring rugs from Flagship Carpets, Joy Carpets and Carpets for Kids. We have a huge selection of classroom rugs to choose from. Whether you are looking for a rug for story time or a rug to bring your classroom to life, you can find it here at Worthington Direct. Your source for quality educational carpets. 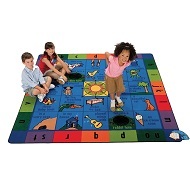 Get the most out of your preschool’s floor space by adding kids rugs to the floor plan. Your students will find inspiration from the alphabet and numbers rugs to reinforce the lessons that are being taught each day. 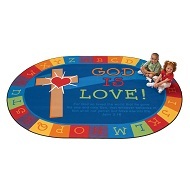 For the toddlers we offer several shapes and activities rugs to help stimulate young minds. Even the music room can benefit from a music rug where students can enjoy the fun activities that come with having such a carpet. Bilingual rugs are used to help assimilate new cultures and languages. You can browse our entire collection of preschool furniture or give us a call if you need help finding the right piece of furniture for your organization.